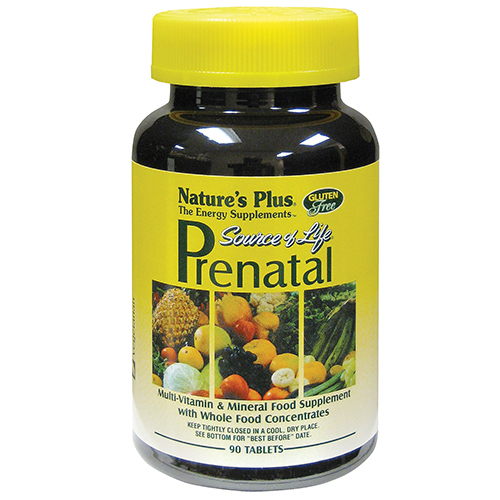 Natures Plus Source of Life Prenatal Multivitamin & Mineral has been designed to provide optimal nutritional support during pregnancy. 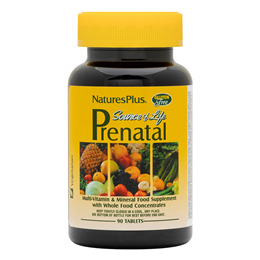 Source of Life Prenatal Multivitamin & Mineral also adheres to the Source of Life formula of success by including a wide variety of whole food extracts in an all-natural, enzyme-activated, vegetarian formula for optimal health and energy. Calcium (As Citrate; Aqueous-Blended Calcium Carbonate And Hydrolysed Rice Protein), Magnesium (As Citrate; Oxide; Aqueous-Blended Magnesium Oxide And Hydrolysed Rice Protein), Bulking Agent (Di-Calcium Phosphate), Vegetable Cellulose, Iron (As Ferrous Fumarate; Ferrous Gluconate; Aqueous-Blended Ferrous Sulphate And Hydrolysed Rice Protein), Lubricant (Stearic Acid And Magnesium Stearate), Ascorbic Acid, Biotin, D-Alpha Tocopheryl Acid Succinate, Pineapple Fruit, Zinc Citrate, Glazing Agent (Pharmaceutical Glaze), Niacinamide, Lactobacillus Acidophilus, Bifidobacterium Bifidus, And B Longum, Calcium Pantothenate, Potassium Citrate, Anti-Caking Agent (Silica), Manganese Citrate, Kelp, Choline Bitartrate, Riboflavin, Thiamin Hydrochloride, Beta Carotene, Pyridoxine Hydrochloride, Inositol, Potassium Iodide, Brown Rice, Banana, Apricot, Apple, Broccoli, Beet Juice, Kale, Peach, Tomato, Spinach, Cyanocobalamin, Ergocalciferol, Folic Acid. As a food supplement for pregnant or lactating women, take one tablet daily. Below are reviews of Natures Plus Source of Life Prenatal Multivit - Tablets by bodykind customers. If you have tried this product we'd love to hear what you think so please leave a review.